Studying cell functions for cellomics studies often requires the use of purified individual cells from mixtures of various kinds of cells. 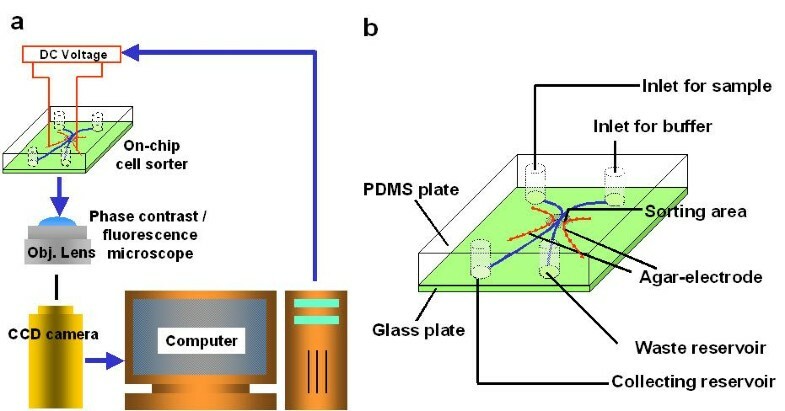 We have developed a new non-destructive on-chip cell sorting system for single cell based cultivation, by exploiting the advantage of microfluidics and electrostatic force. The system consists of the following two parts: a cell sorting chip made of poly-dimethylsiloxane (PDMS) on a 0.2-mm-thick glass slide, and an image analysis system with a phase-contrast/fluorescence microscope. The unique features of our system include (i) identification of a target from sample cells is achieved by comparison of the 0.2-μm-resolution phase-contrast and fluorescence images of cells in the microchannel every 1/30 s; (ii) non-destructive sorting of target cells in a laminar flow by application of electrostatic repulsion force for removing unrequited cells from the one laminar flow to the other; (iii) the use of agar gel for electrodes in order to minimize the effect on cells by electrochemical reactions of electrodes, and (iv) pre-filter, which was fabricated within the channel for removal of dust contained in a sample solution from tissue extracts. The sorting chip is capable of continuous operation and we have purified more than ten thousand cells for cultivation without damaging them. Our design has proved to be very efficient and suitable for the routine use in cell purification experiments. Developing of a cell based screening assay often requires identification and isolation of particular cells from a mixture of various kinds of cells. Moreover, in order to obtain reproducible data on cells, reliable and non-destructive purification of cells is essential. Efficient and rapid sorting of cells has been accomplished with techniques such as fluorescence-activated cell sorting (FACS) , magnetic-activated cell separation (MACS), automated single-cell sorting using dual-beam optical trapping, differential adhesion cell sorting , and micro-fabricated fluorescence-activated cell sorting . 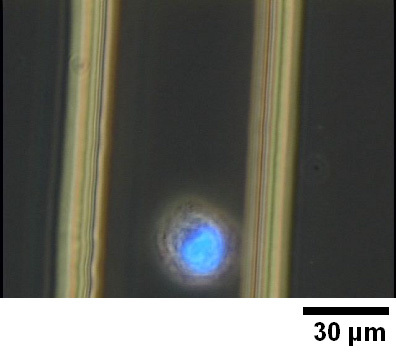 These conventional cell sorters can be used for purification of individual cells, but are not ideal techniques and have a number of disadvantages.. For example, FACS can damage cells during destructive droplet generation, and the detection (based on the non-direct scattering) has poor cell recognition performance. Other conventional techniques also have disadvantages with regard to their cost, efficiency, response speed, separate resolution, and adaptability. Furthermore, if cells are to be cultivated after subsequent sorting, the damage to cells caused by to the sorting process should be minimized. Advantages offered by application of microfluidics include reduced sample volumes and reaction times, lowered space requirements and operational costs . In micro- and nano-technology liquid flow is mostly laminar and this further facilitates making microscopic sorting devises for biomedical applications. We have developed new on-chip microfluidic cell sorting system, which overcomes problems associated with the conventional cell sorting techniques. Our system directly monitors and recognizes cells with specific index using phase-contrast/fluorescence microscopy and image processing, and it can rapidly and safely sort them according to the index (shape, and spatial distribution of fluorescent dye of the specific antibody marker, and so on) in a laminar flow using the electrostatic force. The electric force is applied only to the cells which have to be removed to waste; the target cells simply flow down the laminar flow and do not receive any stimulation from non-contact forces. In this paper, we explain the design of the on-chip cell sorter system and give the results of an experimental implementation of our design. As shown in Figure 1(a), this system consists of the following four parts: disposable cell-sorter chip, optical microscope equipped with phase-contrast/fluorescence image processing module, charge-coupled device (CCD) camera with image intensifier, personal computer with image processing software for cell recognition and sorting control. Figure 1(b) shows the schematic drawing of the disposable cell-sorter chip. The chip was made of poly-dimethylsiloxane (PDMS) [5–8] attached to a thin glass slide. Microfluidic channels and gel electrodes are fabricated within the PDMS structure by moulding the thick photo-resist microstructure. We have chosen PDMS so we could make replicas of the microfluidic channels within 1 hour by using a simple moulding process. The design of cell sorting system (a) schematic view of the cell sorter system. (b) schematic view of on-chip cell sorter. Figure 2 also shows the detailed cross-section view of the cell sorter chip and the microfluidic channels. The design includes two symmetric flow channels for passing sample solution and liquid buffer. They form the junction at the centre of the chip (cell sorting area) where two laminar flows from the two channels meet. At this boundary (see A-A' section in Fig. 2), cells in the sample solution flow can be transported to the other buffer flow by electrostatic force. Importantly, the voltage is only applied for removing the undesired cells from the sample. 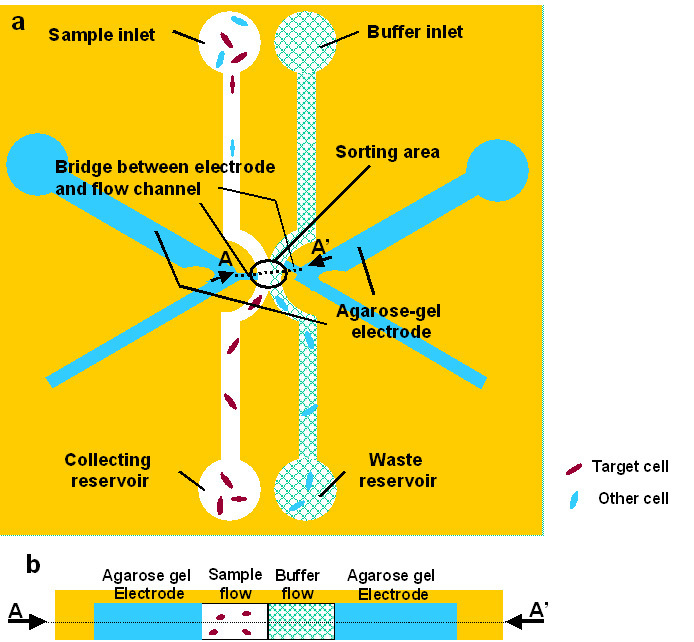 In this sorting area, two wide channels filled with agarose gel electrodes are connected to the flow channels with narrow channels filled with electrolyte. The agarose gel electrodes are made of 1% agarose (Sigma, Agarose Type2-A, MO, USA) and 1-M NaCl as electrolyte. Whole structure of on-chip cell sorter. The process of the cell sorter chip fabrication is shown in Figure 3. First, the microfluidic channel for transportation of cells is fabricated with a mould made of thick negative photo-resist, SU-8-25 (viscosity of which is optimised for 25-μm-thick photo-resist layer: Microlithography Chemical Corp., Newton, MA, U.S.A.). After development of the 25-μm-thick SU-8 microstructure on a glass plate, the master is baked at 200°C for better adhesion between glass and SU-8 pattern. Next, a 10:1 mixture of silicon elastomer base (PDMS pre-polymer) and curing agent (Sylgard 185, Dow Corning, Midland, MI, U.S.A.) is poured onto the master and cured for 1 h at 75°C. After curing, the PDMS replica is peeled from the master and is oxidized with a plasma cleaner (Compact etcher FA-1, Samco international research centre, Kyoto, Japan) for 30 sec. at 55 W. Subsequently the oxidized replica is attached to a glass slide as soon as possible. Firm attachment between them is completed with this simple method. 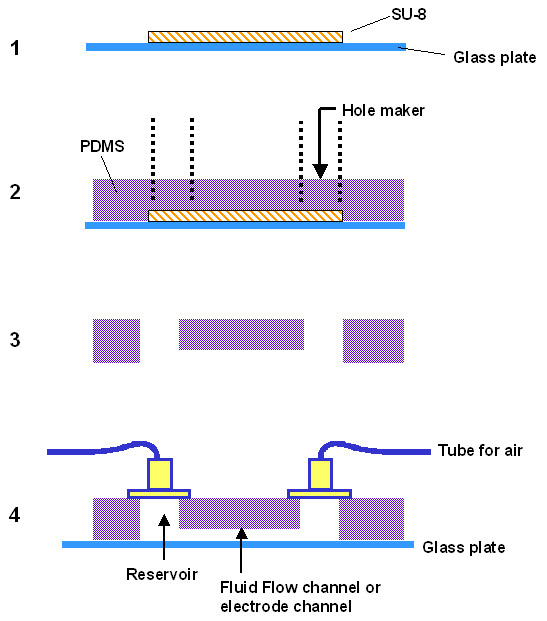 Inside the channels, sample liquid or agarose gel are injected by application of air pressure. The process for fabrication of on-chip cell sorter. Figure 4 shows the cell sorting process using our non-destructive cell sorting system. When the target cell reaches the sorting area, no voltage is applied to gel electrodes and the cell passes through this area within the same laminar flow (Figure 4 (a)). When the other undesired cell reaches the sorting area, a DC voltage (up to 10 V) is applied to the gel electrodes to generate an electrostatic force and the cells is transported to the other laminar flow. The direction of cell's transportation depends on the combination of the electrostatic force and Stokes' viscous drug (Figure 4). Principle of our cell sorting method. (a) without DC voltage irradiation: sample cells flow down within the central laminar flow, (b) with DC voltage (up to 15 V) application: cells move from sample channel into the opposite side of channel connected to waste channel by resultant force of electrostatic force and laminar flow. Figure 5 shows an example of sorting process using COS cells. 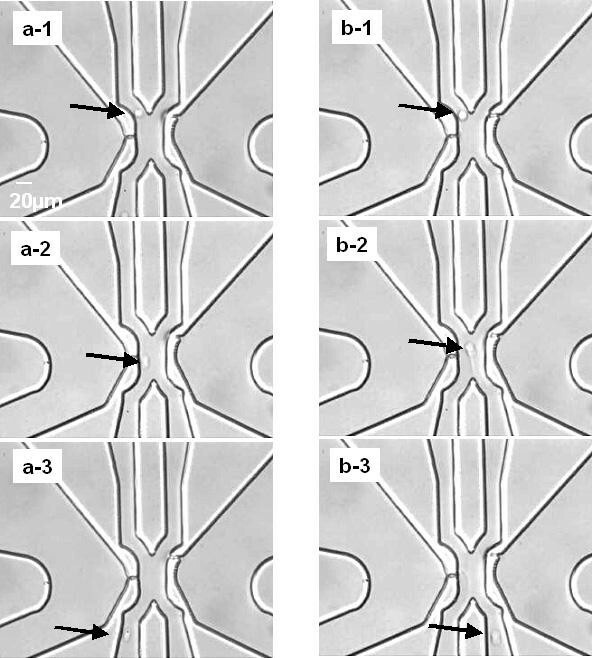 When no voltage is applied, COS cell flowed straight down the same channel (Fig 5(a)). However, when voltage was applied, COS cells smoothly shifted from the sample channel to the waste channel (Fig 5(b)). In this experiment, the applied voltage and current were 15 V and 25 μA, respectively. Micrograph image of sorting COS cells. A series of (a-1, 2, 3) with DC voltage application, a series of (b-1, 2, 3) without voltage application. Our cell sorting system differs form other available systems in that only the cells, which have to be removed, were affected by the electrostatic force. The target cells had no force applied and therefore had minimal or no damage done to them. Moreover, the area of the electric field is limited to the cell sorting area, because the electric current flows only between the two gel electrodes. Thus cells out of the area receive no significant damage from the electric stimulation. The phase-contrast image of cells is analysed using the image processing module and computer. 100× magnification objective lens was used for recognition of the fine structures of cells. Figure 6 shows the one example of the phase-contrast/fluorescent image of a COS cell within the pathway. As shown in the figure, we can distinguish the shape and distribution of cell component within the cell by non-destructive fluorescent staining. The high-resolution image was accomplished by the use of the 0.2-mm thin glass slide at the bottom of the chip, which is within the working distance of the objective lens. Thus using these processed images acquired by optical microscope, we can decide whether the cell should be kept or removed, and therefore and whether to apply the DC voltage, which can be done within 1/30 s using our analysis program running in the personal computer. It should be noted that the 1/30 s resolution is only limited by the resolution of video frame interval and can be improved up to 1/200 s resolution using the same system equipped with the camera capable of capturing 200 images per second. Micrograph of COS cells in the chip pathway. 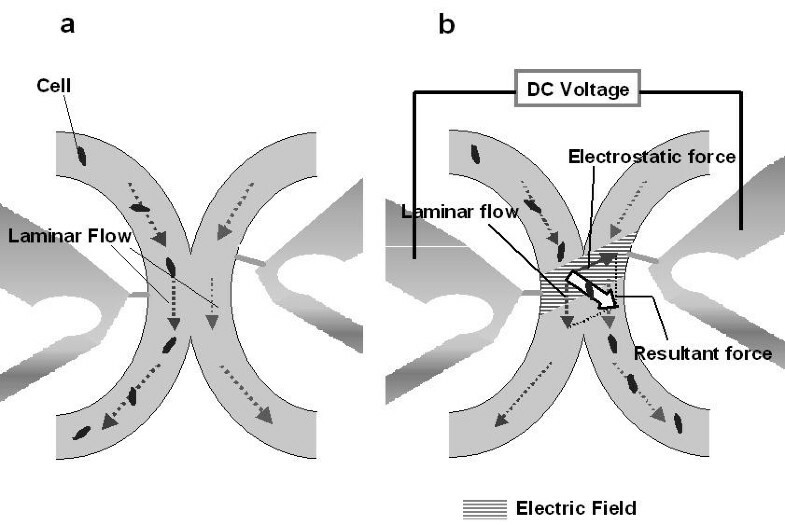 As explained above, DC voltage is applied into the sorting area for generation of electrostatic force as driving force of cells' shift from one flow to the other. Although application of high voltage between a pair of agar-gel electrodes forms high electric field enough to transport cells, it heats the agarose gel electrodes. The melting point of agarose gel is about 80°C. Thus application of excessive voltage causes malfunction of the agarose gel electrode. Agarose gel composition is critical in reducing the resistance and therefore the heat generation. 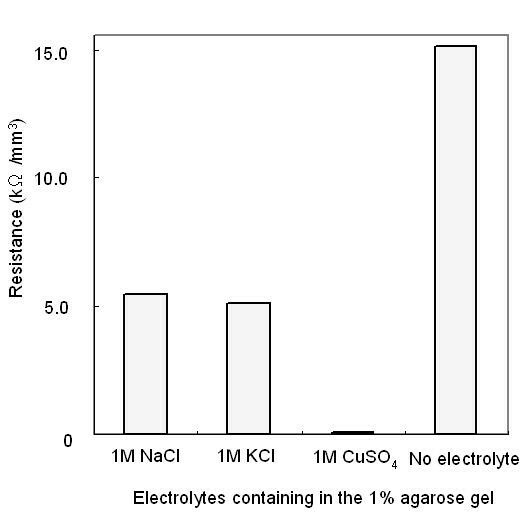 Figure 7 shows the resistances (Ω/mm3) of 1% agar electrode containing various kinds of electrolytes NaCl, KCl, CuSO4, and without electrolyte measured by impedance analyser (Agilent 4294A, Agilent Technologies Japan, Hyogo, Japan). The concentration of these electrolytes is 1 M each. Although agar-gel containing CuSO4 has lowest resistance, we chose NaCl as the electrolyte because we think low impact to cells in chemical environment should have priority to anything else. Importantly, ions such as Na+ and Cl- do not stimulate cells unlike other ions such as Cu2+, K+, Ca2+ or Mg2+. Also, 1% agarose containing highly ionic strength electrolytes such as MgSO4, CaCO3 or ZnSO4 is difficult to set at room temperature. Electrolyte dependence of 1% agar gel resistances (Ω/mm3). When sample liquid flows in a narrow channel minute dust particles or aggregates of dead cells may block the channel. Therefore, such dust and similar particles must be removed from the sample solution. We have therefore added a filter structure into the sample buffer channel. Figure 8(a) shows the schematic drawing of structure of the filter. It consists of several pieces of micro-sized poles fabricated inside the PDMS microstructure. The spacing between the poles (ca. 15 μm) allows capturing most dust particles. Figure 8(b) illustrates the efficiency of this filter. Only dust particles were trapped by this filter structure. The structure of micro-sized filter in the channel. (a) micrograph of the actual use of the filter and (b) schematic view of it. Although the target cell does not receive an electric damage, application of lower voltage is preferred if a portable, cost-effective sorting system is sought. Figure 9 summarises how the accuracy of cell sorting depends on the voltage applied. In the graph, each data was an average of 5 sets of samples. 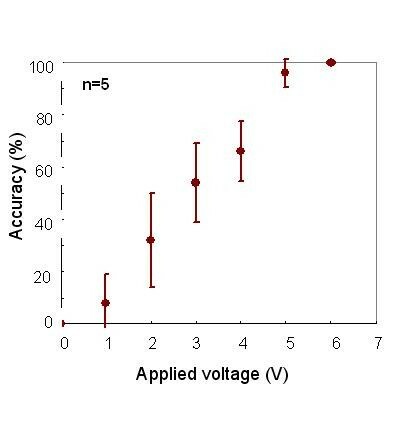 Figure 9 illustrates that 100% accuracy can be achieved by applying 6 V to the electrodes. Sorting reliability against applied voltage intensity. We have developed anon-chip cell sorting system that can separate target cells mildly and reliably using our original method and bio-compatible materials, such as agarose gel that is used as the electrode for the generation of electrostatic force in the flow channel. Cell sorting is based on the image analysis processed automatically by computer. A micro-sized filter for a dust-free flow is fabricated in order to purify sample cells and avoid blocking of the channels by dust particles. Using our system we have achieved 100% accurate sorting. We plan to extend our approach to single cell analysis and regenerative medicine. Financial support, in part by the Japan Science and Technology Organization (JST) and by Grants-in-Aids for Science Research from the Ministry of Education, Science and Culture of Japan, is gratefully acknowledged. KT carried out the microchamber design, cell preparation, measurement of cell sorter performance, and image analysis. AK developed the image processing software. IS carried out the microchamber design and cell preparation. TI and KY conceived of the study, and participated in its design and coordination. All authors read and approved the final manuscript.